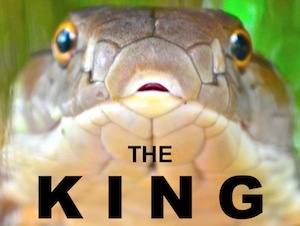 King cobras can be found in and near Bangkok because there is an abundance of rat snakes, a favorite prey. Are Dangerous Snakes in Bangkok, Thailand? The answer is yes, of course. There are venomous snakes all over Thailand from the southernmost to the northernmost parts of the country. Though Bangkok is a big city, there are still places for snakes to make a home. Waterways, drainage ditches and pipes, and trees and bushes are the primary places snakes can be found in this capital city of Thailand. 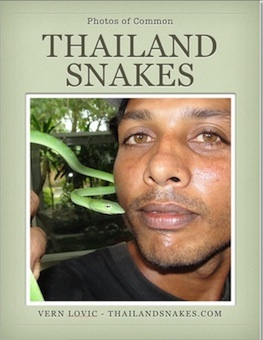 If you want to get our FREE Common Snakes of Thailand ebook you can read on your computer, tablet, or phone, CLICK HERE to become a free member of our site and get your FREE COPY of the book. Which Dangerous Snakes are Found in Bangkok? Being a big city, surrounded by waterways (canals, klongs) frogs, rats and other rodents, birds, fish, and lizards are common. These are primary sources of food for snakes – even pythons will eat frogs that are hardly a meal for them. PYTHONS – usually Reticulated pythons – Python reticulatus, are found fairly often in the city of Bangkok. They tend to sleep in the trees or bushes and hunt prey at night. Pythons don’t typically target humans, but they can give a wicked bite – having over 70 very strong, VERY sharp teeth to inflict damage with. The Burmese python – Python molurus, is also found in Bangkok, but in smaller numbers. COBRAS – there are 3 species (at least) of cobra you may find in Bangkok: Monocled cobra – Naja kaouthia, King cobra – Ophiophagus hannah, Indo-Chinese spitting cobra – Naja siamensis. All of these snakes are deadly and should be avoided. These snakes will not chase you, so if you gradually move away, you will likely be fine. Some snakes strike when they sense you moving away fast, so move very slowly. KRAITS – though a couple of kraits (Banded krait – Bungarus fasciatus, and the Malayan Krait – Bungarus candidus) might be found in Bangkok, you will likely never see one unless you visit the Queen Saovabha Memorial Institute (Bangkok Snake Farm). They come out at night and avoid people for the most part. Kraits have the unnerving habit of crawling into homes with their doors to the outside open. So, keep your doors shut, and don’t fall asleep on the ground. I saw a video on Youtube that showed a krait climbing into a tent – so, be careful anytime you’re sleeping outdoors. VIPERS – the snake responsible for the most deaths across the world is probably the Russel’s Viper (Daboia russelii), (Chain Viper). These are found in central Thailand. These snakes have a strong venom, so envenomation must be treated quickly. They prefer the rainforest and lay in wait for prey – so if you’re walking around in wooded areas, or areas where you cannot see your feet due to underbrush – you are at some risk. The snake responsible for more bites and many deaths (under 10 per year reported) in Thailand each year is the Malayan Pit Viper (Calloselasma rhodostoma). This is another snake that stays still and waits for rodents to run by. The venom is very strong and destroys all living tissue, including bone. Again, don’t walk in areas with underbrush where you cannot see where you’re stepping, or what you are stepping beside. These snakes are primarily active at night, but also will become active during cloudy and rainy days. Which Non-Venomous Snakes Can Be Found in Bangkok? Many! There are around 200 species of snakes in Thailand and many of them can be found in and around Bangok (central Thailand). The most common snake you might find is the Golden tree snake – Chrysopelea ornata. Are You Likely to Find a Snake in Bangkok? That depends on you. If you’re looking for them, you may find some. I have a friend in Bangkok that walks around at night with a bright flashlight and camera so he can take photos and video of the snakes he finds – usually in areas with trees. 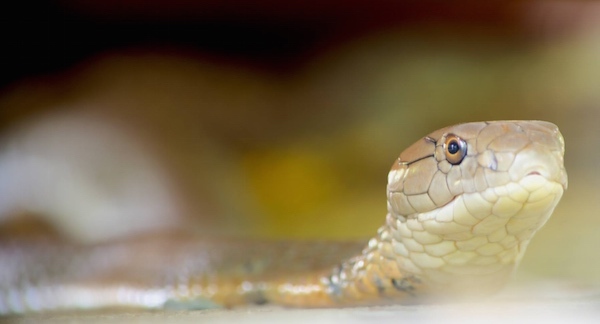 If you’re walking around concrete streets and sidewalks during the day, or night, you’ll probably not come across a dangerous snake in Bangkok. Most of the snake sightings I am asked to identify involve tree snakes (not dangerous) on balconies or even coming in through an open window. These snakes can climb walls – they are excellent climbers. Of course it throws people into a panic. 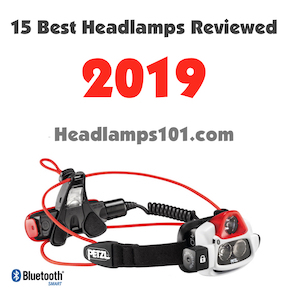 Get the free ebook – and take a quick look through the photos and the information. It will help you feel better about snakes because you’ll see that very few are dangerous to you. Snakes never chase you or hunt you. They are acting entirely defensively when they strike. It is because they fear you. Best of luck to you, enjoy Thailand’s amazing diversity! I saw snakes almost every day from 1973 to 1975 while a Peace Corps volunteer in a college at Nakorn Sri Thammarat, 13 kilometers out of town near Khaaw Luang. Mostly red-tailed racers, but i had a six foot long intruder in my dresser on a second story my second year. Sadly I was frightened and killed him with my baseball bat. Thanks for all your information, as I am writing my memoirs. I tried to get the free book but unfortunately although I got the email link that is as far as I got. I ran over a snake on my bike this evening before I saw it as it slithered across the dirt track. About 1-1.5 m long predominantly dirty green colour, largish head. I did not realise until it had happened as I was rattling along a bit trying to get home before rain. No distinctive pattern and when I turned round to see if it was OK it had gone. If you have a VPN – the downloads don’t tend to work. You have that? The snake – hmm, could have been anything – but vipers don’t really get over 1 meter. If you’re sure it was bigger, it could have been the Red-tailed rat snake, the golden tree snake, a green cat snake (but they are almost always nocturnal), or maybe something else entirely. Let me know if you still have trouble getting the free ebook – go to another computer. Try again. Turn off VPN for a minute. Or write me directly to ask for it by email. I tried to get the ebook. I’m in Thailand. Where is it? It’s still there. lol. Check your email spam and trash folders for the email from us that gave you the link to get the book. teeth and horns snake what isthe price? Sir, what in the world are you asking me? I try to get this ebook but did not succeed, can you send it on my email, please. I live in thailand and need to know a lot, since I am crawling in the woods and other places trying to save dogs. A good guide for identifying venomous snakes. I found this morning outside at my terrace a silver kind of green. Small body 60-70 cm with tin tale out like a needle. It was very tough. Not afraid at all. It whent down to the bushes close to the house and when i pushed the bushes with a stick it whent up on the top and looked att me. Not afraid. What kind of snake can this be. Live in Petchaburi Kiri Khan area. Good question Micke. The small, thin green snakes are known for getting away as fast as possible – so fast you probably wouldn’t even see it. Was the body green and the tail reddish or brownish or even pink? Could maybe have been a viper then… Possible I guess. 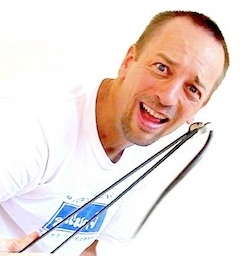 Many years ago I was riding a motorbike in Koh Samui around 9am when I crested the top of a hill and saw a large snake literally the length of the road, crossing the road very quickly. It looked as wide as a boa. It was green on the top half of the body and yellow on the bottom half of the body. What was really interesting was that the snake crossed the road by moving its body up and down instead of sideways like most snakes. When I returned the motorbike and told the vendor, he said I was lucky to have seen it. I have been wondering for the past 30 years what kind of snake I saw. Thank you. A snake about the width of the road and that color would probably be a king cobra. There are a number of them on Koh Samui and they are active during the day more than night. Are the Malayan Pitt Viper and Russell’s Viper two different Snakes and which is the most Dangerous if they are?. Yes, two different snakes. Hard to say which is most dangerous… they both can kill you. The Russel’s viper is only located in Thailand’s central provinces. Malayan pit viper is all over Thailand. Both have huge fangs and nasty venom. Cheers! We are going to khao lak and would like some advice on sea snakes and the chances of encountering one? Apparently they are not bitey, but don’t stick your hands near one – they have some super-toxic venom. Nearly all sea-snakes are venomous – so, keep that in mind. Have fun! Try your spam folder, and trash folder. Maybe you have a filter set that filters out the email from us. Check all emails you received from us – it’s not very obvious, it’s just a text link. Let me know if you don’t find it. By late September we should be having HEAPS of rain – which is sometimes good for snakes, sometimes it’s just too much and only certain species are out. Good luck with your herps – be careful out there. Cheers! My wife is thai and I plan on retiring there not anytime in the near future but when we build our house i will be looking into some anti snake defense around my house any suggestions? My book on the subject is coming out shortly – a month tops. Keep checking https://facebook.com/ThailandSnakes for news. Cheers!